"Give me the youth of america!" This was the prayer that started it all. Long before it was our prayer, and long before even the prayers of our spiritual fathers and mothers of the faith, this was the eternal cry in the heart of God. This is our heart cry -the groan of the Eternal Intercessor for our generation. We believe that we are on the brink of a great move of God in our nation. We dare believe that contending prayer will rend the heavens for another outpouring of the Holy Spirit in our day. Every great move of God has been preceded by great movements of prayer. We are contending for a prayer movement that births an awakening, an awakening that thrusts forth laborers to the ends of the earth, and a missions movement that ushers in the return of the King. God is not yet finished with the youth of America! Throughout history, there have been mighty moves of God through the young people, and we believe that we are in the midst of one. Such moves of God have been preceded by great movements of prayer -birth pangs of the revival to come. Four years ago, the Purple Pig Tour came through 10 college campuses in California, calling young people to plant prayer furnaces or "fire houses" on the campuses of America. At each stop, they called forth a wave of sacrificial love and radical consecration. The spirit of God fell during the tour, marking hundreds of student's hearts, including us, with fire. This led to us and a gathering of other students to start a Student Revival Movement. We began to corporately burn -consecrating ourselves to pray for their college campuses. In Northern California today, we are witnessing prayer furnaces not only rise up, but continue to burn and strengthen within the past two years. As Audry and I moved down to SoCal in January, we have partnered with friends down here to see over 7-8 prayer furnaces established and strengthened! Over the past few years, we have also invested in student leaders across the nation to plant prayer furnaces. This past Spring, we embarked on the California for Christ tour with SAFA and TheCall. 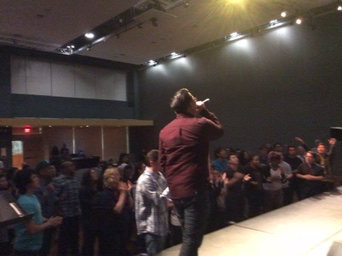 We toured to 12 universities and cities, calling forth another generation to give themselves in prayer and fasting. There are testimonies of college students are giving themselves to prayer and seeing the harvest on their campus. We believe that when ekklesia arises as one man, it will take Land! It's time for conquest! It's time to start fires of revival and awakening in California and America. There is a movement of prayer -not simply prayer meetings, but gatherings of burning ones crying out desperately for a move of God on their campuses. This is the type of prayer that moves heaven and earth. We believe we are in a a time where we will see millions of souls saved and the mass harvest in the campuses and cities of America. We dare believe that this generation could arise to go to the ends of the earth to finish the Great Commission. Will you join us in crying out "day and night" like the persistent widow in Luke 18? Will you tarry until He comes? We urge you, set your face to praying and fasting on your campus! We are believing for a "revival core" on every campus of America. By revival core, we simply mean those who have declared, "give us God at any cost!" Even in the past 4-5 years, we have seen these companies of young people gather together consistently and fervently to seek God's face for revival. God is looking for more than events -although we have seen God catalyze great movements from strategic nights of worship, proclamation, and prayer. We believe that God is looking for those, even little groups of 4 and 5, who can set their face day-in and day-out to contend for revival. As laborers and leaders on the college campuses, Audry and I are not even as interested in events and tours as much as we are in investing in these revival cores/prayer furnaces. From California, to the Northwest and the Northeast, these alone will shake the gates of hell and move heaven! These pictures on the side are events that these prayer furnaces have hosted, along with prayer meetings that we have had over the years! Our hearts burn for the youth of America. Having been involved in prayer furnaces while we were in college, we know full-well the glory and the grind of pursuing God and His purposes. Post-graduation, post-transition, post-everything...just when it seemed that we were done with college campuses, God pulled us back into His purposes for these universities. The best news: we are but two among many who are laboring on and serving these college campuses...there is a movement of God that is larger than any one man or one ministry. We can only dream and hope to play our 'little part' in the mighty plan of God for this generation. Our prayer is that we might shine as a faithful pixel in the great picture of God's work on the earth! In this season, we are mainly focused on California and the campuses in the Golden State. We are laboring and contending for another generation that can fast and pray to birth another Great Awakening. For years, we labored in Northern California, and saw God establish prayer furnaces. The student leaders that have risen up have far surpassed our wildest dreams and accomplishments. In the past few months, we have seen God do the same in Southern California. Moreover, we have had the privilege of pouring into students in the Northwest, and recently in the Northeast in partnership with JHOP Boston. In the past and today, we have been involved in (and hope to grow in) the following ways in serving these prayer furnaces. We are by no means perfect, but we hope in the coming days to only decrease as they increase; to but serve them that they may fulfill the purposes of God. Establishing: as God leads, we have had the privilege of catalyzing burning students to plant prayer furnaces on their campuses. We try to stay out of God's way as much as possible! In whatever way we can, we help in establishing prayer culture and organization, along with practical starters to not only start but sustain these prayer furnaces. Equipping: whether it is visiting them, hosting retreats, or doing Schools of Intercession, our hearts have not only been to establish, but also equip these students to take their campuses. We prioritize Biblical teaching and wisdom to equip another generation in not only contending intercession, but the whole counsel of the Word and true Christian discipleship. Encouraging: this is our most important ministry. We don't seek to build a movement or organizations, but people. These students are the ones on the front lines of battle. Whether it be through incarnational ministry or phone calls, we do our best to support and encourage the student leaders on the campuses. We pray and fast to see them enter into the fullness of their destiny. In all of our service, our goal is not to build another 'movement' or 'network.' In fact, our labors with this movement and family (more below) aim to be void of names, titles, or brands. God's plan is so much greater and higher. It is a "nameless and faceless generation." Our hearts are simply to serve these student leaders and father/mother them to lay hold of the promises of God for their campus and region. Our vision is to see a prayer furnace/revival core on every campus and in every region of America, unto the ends of the earth. Our calling is to lay down our lives to serve these leaders. Together we dream for a Great Awakening and Student Volunteer Missions Movement. God is truly doing something! There are students across California and this nation that are laying down their lives as intercessory offerings for their campuses. These student leaders are our heroes. We are simply honored to be a part of what He is doing in our generation. We are honored to call them family. We are in relationship and partnership with these prayer furnaces to various degrees, from close, covenantal family to affection and coordination across the nation. As Christians, we hold the Scriptures as our supreme authority and the Holy Spirit as our true guide. As a family, we hold spiritual leaders, fathers and mothers dearly in honor and authority. In all of such however, we are not part of any singular organization, 501c3, ministry, movement, label or brand. Many of these prayer furnaces have had their own storylines, leadership, and beginnings. What joins us together across campuses and regions is covenantal love and purpose to see God move in our generation. The following are our friends and covenant family across the nation! God has not called us simply to a movement, but to family. In all of our doing, we have sought by God's grace to move forward as a covenant family. From Northern California to Southern California; from the West Coast to the East Coast, we hope to see the dream of God as family of God. In view of all these endeavors, please prayerfully consider partnering with us for college campuses! Together, let us dream for prayer, awakening, and missions on every campus and region of America! Unto the uttermost parts of the earth! As we do not receive any finances from our labors on campuses, we are looking for monthly partners who can fuel the work. Learn more about partnership on our page.